I’ve had my ABS backpack since 2011. Since then, I have worn it almost everytime I’ve been on the mountain. I have pulled the trigger 4 times, two of which in situations that I perceived was critical (one wasn’t – I lost my balance in a whiteout and thought I was in a slide…). On three of these occasions, both balloons have inflated as expected. During my tumble down the mountain in Kittelfjäll however, one of the balloons (or the nozzle, I’m not really sure) broke, probably due to getting hit against a tree. This prevented one of the balloons from getting fully inflated while the other one was completely empty when I came to a stop. 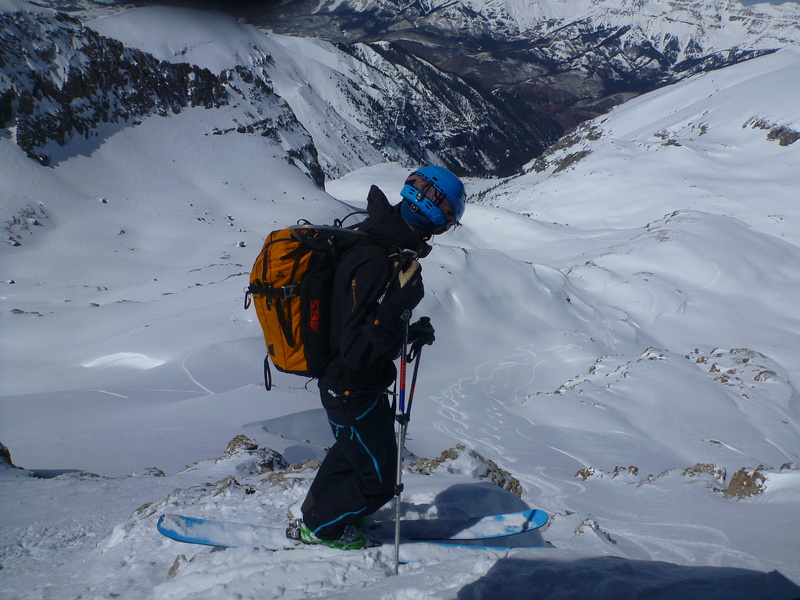 Since I’ve had the privilege to ski tour with both my ABS and with a Mammut Ride (28 l) backpack, I thought that I would write something about my experience of the two (not a formal review, just a few spurious thoughts). A good thing with the ABS is that there are now a range of manufacturers that make covers in different sizes that are compatible with the ABS base unit. I have a 25 l Arva and a 42 l Dakine. I haven’t had a chance to try the Dakine one, but the Arva has worked really well (with one exception – that some of the stitches has broken). I’m sure the Dakine one will too. However, in my opinion, the Mammut Ride is a better backpack when it comes to comfort. This is not very strange since Mammut started out making backpacks and then adjusted them to be compatible with an airbag system. However, comfort is naturally extremely important when you do long tours, and, at least for me, I find that I get much more back pain after a day on the mountain with an ABS than I do with a Mammut. One reason for this is that I’ve had trouble getting the backpack balanced. The straps connecting the bandoilers to the back pack are just not very good. Another important thing is the belt around the waist. I really like the belt on the Mammut, mainly because the buckle makes it so easy to adjust. The belt on the ABS is a bit tricky. The buckle is slimmer than on the Mammut, and (at least for me) that makes it more difficult to adjust. This has resulted in more weight being put on my shoulders, hence the back pain I guess. However, it should be noted that most of my friends with ABS:s don’t have this problem so it might just be me. Another thing that I like more about the Mammut than on the ABS is the safety strap that goes between the legs (to prevent the backpack from coming off during an avalanche). The use of the strap has been shown to be extremely important for the backpack to work as it should. On the Mammut, the strap is sown to the back on the backpack and has a loop on the other end of the strap that is used for attaching it to the belt. On the ABS, the strap is clipped on to the belt by plastic buckles. The plastic buckles are tiny and doesn’t really induce confidence that they will hold. I guess the tests show they do, but my strap released spontaneously several times… I have therefore put on a strap with a loop in both ends on my belt. This is the one I had on in Kittelfjäll. What I really like about the ABS is the handle/trigger. It is super easy to pull. You just need a finger or two. When we were caught in that avalanche in Kittelfjäll, two of us tried to pull our triggers. Only I managed to do it. Now, I don’t know if this is because of how easy the trigger goes off, but it sure helps when you just have a split second to do it. The fact that I managed to pull my trigger did not make me less buried than my friends in Kittelfjäll (all of us were either partially buried of very very close to the surface, probably due to the fact that we didn’t go very far and since we were in the trees), but it did make me swim through the snow instead of tomahawking down the mountain. Both Martin and Maria had their heads down several times, I did not as I remember it. In addition, the balloons may well have protected my head from more serious injuries than I got from hitting the trees. The down side of the trigger is that it is white, in combination with that the connection clogs up, which makes it hard to connect the trigger to the back pack. The white color makes it really hard to find it if you drop it in snow (this has happened to me several times), but it is apparently something that can’t be changed. Since the trigger contains explosives, and since color contains metal, ABS doesn’t want to add color to the handle. It may therefore be wise to put some bright tape on the handle. The connection clogs up due to moist (I don’t really know the right word in English for this, perhaps “oxidizes” or “gets covered with some form of verdigris”?). This happens even if you keep your backpack indoors all the time when you are not using it. You are supposed to insert oil in the connection (the backpack comes with it), but it is easy to forget and its quite annoying when you’re standing on the parking lot and can’t get the handle in place (it is also the reason for why I have lost my handle a number of times). I clearly need to get better at doing my homework. If you do what you are supposed to do, the trigger connection works quite well. As is probably quite clear, there are some things about the ABS backpack that has annoyed me from time to time, and I must admit that I’ve been tempted to switch to a Mammut. I don’t know how it works with Mammut, but one extraordinary thing about the ABS is the way they deal with customers who’ve been in an avalanche. Apparently, ABS has a routine to analyze how the avalanche affected the backpack and how it worked in a critical situation. They therefore ask you to send the backpack to them if you’ve had an accident. ABS does this in order to make sure the equipment work as it should and to conduct product development. For you, their policy means that, if anything is broken, ABS will either fix it or send you a completely new base unit. For free. I find that service worth more than all the small annoyances that I’ve had before. EDIT Dec 6th 2014: WildSnow has written a review of the different airbag systems available at the moment that may be of interest. I couldn’t agree more regarding the features that a really good airbag backpack should have: A light pack, easy refills and easy airtravel. Travelling with the ABS canister has worked for me when flying within Europe. However, it is really a hassle when traveling over seas. WildSnow seriously dislikes the trigger mechanism on the ABS. I agree that the two-part model is not ideal, but my problem is mainly that the connection keeps clogging up. I find it much easier to trigger the ABS than the Snow Pulse. Perhaps that has nothing to do with that the trigger on the ABS contains explosives while the Snow Pulse does not, but regardless of which I find it extremely important that I know that I can trigger my airbag when I tumble down the mountain. With the ABS I feel safe on that regard. Having that said, I really look forward to trying both the Black Diamond and Scott Alpride systems. I too still await the winner. Previous Previous post: Say NO to drugs (and yes to beer)!